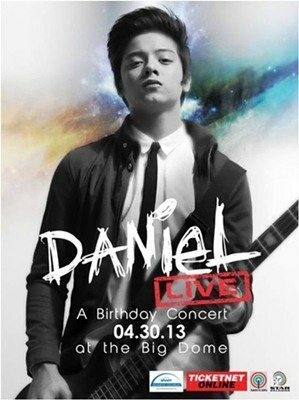 Recording artist and matinee idol, Daniel Padilla, is charming his way to your TV sets as SKYcable PAY-PER-VIEW brings his upcoming birthday performance entitled ‘Daniel Live: A Birthday Concert at the Big Dome’ –live and commercial-free on April 30 at 7:30PM. Fresh from the success of his blockbuster film ‘Must be… love’, Daniel is now set to celebrate his birthday with a bang as he holds his first solo concert. Serenading his loyal fans with his ‘old school rock’ style of music, Daniel is sure to dominate the Big Dome as he performs his renditions of OPM classics such as ‘Prinsesa’ and ‘Hinahanap-hanap Kita’ and his newest hit single ‘Nasa Iyo Na Ang Lahat’. Aside from these hit songs, he is also expected to perform songs from his self-titled Double Platinum album and his newest album DJP. Also to show their support at the star-studded event are Daniel’s ‘Princess and I’ co-stars Enrique Gil and Khalil Ramos, together with love-team partner Kathryn Bernardo with their own much-awaited performances. Catch today’s brightest star and let your family enjoy, in standard definition, the live concert experience of Daniel Padilla’s most-anticipated first solo concert at the comforts of your own home on SKYcable channel 135 for only P399. As an added treat, SKYcable PAY-PER-VIEW is also giving their subscribers exclusive behind-the-scenes scoop before the live coverage. Enjoy this special cable TV viewing experience and take your family’s home entertainment to another level as SKYcable continues to innovate to bring you only the best in cable TV entertainment. To subscribe to SKYcable PAY-PER-VIEW, call 381-0000 or visit www.mysky.com.ph. You may also call or visit any SKYcable local branch office nearest you. With SKYcable, experience digital cable TV beyond clear signal.